WASHINGTON — A source familiar with the case says the Justice Department will not compel New York Times reporter James Risen to testify about his source at an upcoming trial of a former CIA officer accused of leaking classified information. Judy Woodruff spoke to Risen in October about the challenges whistleblowers face when they challenge the federal government. 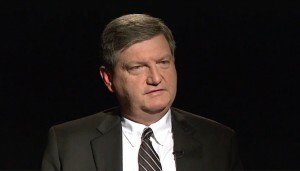 Left: New York Times Journalist James Risen sat down for an interview with Judy Woodruff in October, 2014.